board and see if you can hit the pegs! After you've thrown all five rings, use the number markers to add up your score. Whoever gets the most points, wins the game! 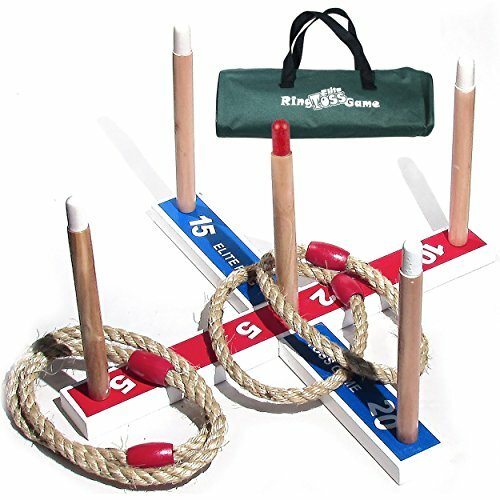 - FAMILY FUN Our ring toss game set includes five durable 42cm x 5cm x 1.8cm rings plus the sturdy wood ring board with point markings on the pegs and convenient carry bag. - HAND-EYE COORDINATION: Tons of fun for adults and helps kids from toddler to school age develop their skills to assist them with writing, sports, fine motor control. - PLAY ANYTIME, ANYWHERE Our ring toss game can be played indoors or outdoors; Free carrying bag lets you take it with you on vacations, picnics tailgating, camping, birthday parties and more! - ELITE SPORTZ 100% SATISFACTION WARRANTY. Backed by the Elite sportz money back Guarantee if your not happy or product breaks. Whether you're playing with two people or with a large crowd, the Elite Sportz Equipment Ring Toss Game Set is sure to have everyone enjoying the experience. For kids, the ring toss game promotes proper hand-eye coordination, helping children develop a skill that will help them with writing, playing sports and many other tasks as they grow.